Gears hold a special place in my heart. There is an element of functional beauty to them. They make things work, but are also mesmerizing to watch, and can be used by those who understand them to incredible effect, like a fine Swiss watch, or this Hummingbird Automaton that was posted to YouTube last month. And at the other end of the spectrum, gears incite massive amounts of nerd rage in my heart when they are misrepresented in a non-sensical way for the sake of a graphic. Looking at you, Planet Fitness. Your shirt is a wearable representation of your “Pizza Monday” policy, as it is accomplishing nothing. 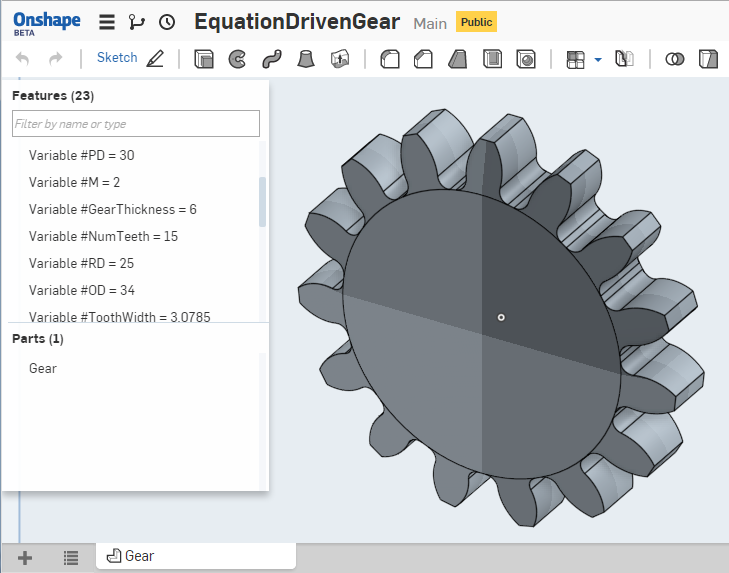 As far as my personal experience goes, I use gears in a lot of the projects I work on for Esselte, so to make my life a bit easier, I used SolidWorks to design a “start-part” gear that can be quickly modified to fit needs with the change of a few dimensions. Until now, I hadn’t thought that would be possible outside of the mainline professional programs. Then Onshape blew my mind. There’s really not that much to say about this particular part in and of itself (it can be printed, but I would recommend removing the bevels from the teeth first), the end result will always be a spur gear. The magic lies in the way it can be customized. To give a bit of background, all aspects of a gear can be driven by the Pitch Diameter (#PD) and Module (#M) (#GearThickness is thrown into the options of what you can modify as well, but it’s less important than the others). The remaining variables are all driven by those inputs to produce the results you see. For instance, the number of teeth is #PD/#M, and the root diameter is #PD-2.5#M. Go check it out by searching for “EquationDrivenGear” in Onshape’s public files. And if you want to know more about gears in general and how they work, Instructables user printeraction shared a very informative post on them. It should be mentioned that there are some limitations to the equation driven gear, and the design can’t take everything you can throw at it. If you have thoughts on improvements, I’m happy to hear them, but the days of designing individual gears are now behind you.